Gluten Free Poor Man’s Krabby Patty is a wonderful way to enjoy tuna, ever had a crab cake? 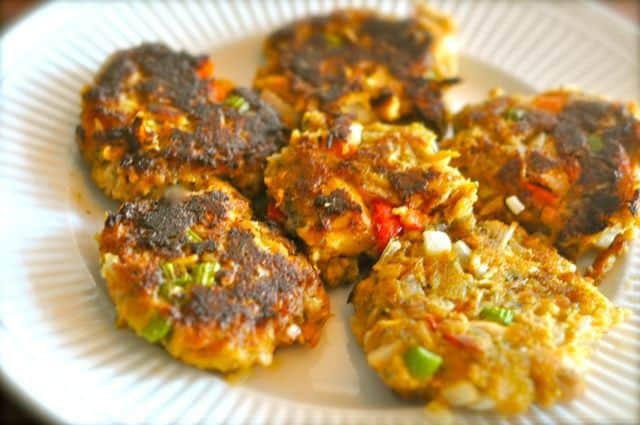 While this isn’t made of crab it is wonderfully savory and light and makes a wonderful tuna patty. This would go well in a sandwich, or even served alone just like it is. If you like gluten-free alternatives, this is the perfect tuna patty for you. Gluten free alternatives are perfect for those of us trying to stay away from gluten products. You can make a delicious dinner without having any gluten in your food. This is a very flavorful tuna patty that your whole family is certain to love. You can make a gluten-free Krabby Patty for dinner. Combine tuna, egg, bread crumbs, onion, celery, red bell pepper, mayonnaise, hot chili sauce, chili sauce, dill, salt, pepper, hot pepper sauce and Worcestershire sauce. Mix well. Shape into 4 patties (mixture will be very soft and delicate). Refrigerate for 30 minutes to make the patties easier to handle, if desired can be made up a day or two in advance. Coat a cast iron skillet with cooking spray, oil or butter(just enough to coat not shallow frying); fry tuna patties for about 3 to 4 minutes per side. These are fragile, so be careful when turning them. Then I pop them into the oven for 5-10 minutes. Using a cast iron skillet makes it even easier. Serve plain or on gluten-free buns. Looking for ideas to serve with tuna patty? Try some of these great recipes. Wow, these were delicious! I used crumbled gf corn muffins I had made the day before with a shake or three of a homemade season salt I use in everything. The only chili sauce I have is a sweet Thai chili, and I used Siracha sauce for the hit sauce. Served with a copycat Bang Bang sauce (from the Bonefish Grill’s Bang Bang Shrimp) and it was fantastic! I just might have this for breakfast tomorrow, too! I bet you will have a delicious breakfast! I love that you used left over corn muffins. Made this tonight with my own twist and came out great. I doubled the recipe and also added cyan pepper, jalapeno peppers, garlic, Italian season, minced garlic, liquid smoke, Korean sweet chili sauce, Korean red pepper paste. Not sure exactly how much of everything I added, but just enough to add a nice spicy kick. This is now an very nice spicy, very healthy main dish. Thanks a lot for the baseline recipe. I was making these back 30 years ago when I was a starving under paid kid. I made these.. They were very tasty.. and I am not a fish eating person.. I rarely make tuna casserole… I made a triple batch since there were 7 eating and the recipe went great.. I did not refrigerate them at all ahead of time.. I did make sure my electric skillet was hot and oiled.. and after the browning times just put the lid on it for 5 more minutes.. Very Good! 1 of my kids loved it.. One of the boys ate it liked it no big deal and made no other comments. 2 others would not eat it.. It was just too different than my usual fare for them. I also sprinkled lemon juice on mine.. even better! I was surprised at how tasty these were. I grew up catholic so I had a lot of fish on Fridays during Lent. These were far better than anything I had as a child. I served these at a tasting dinner, and for everyone there, this dish ranked either number one or number two. Next time I will double up this recipe so I can have them later. I love the look of this recipe and can’t wait to try it!